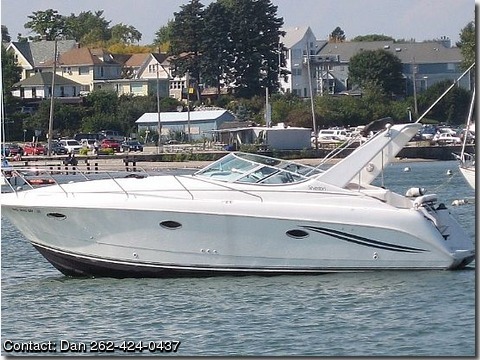 Your are looking at one of the most ROOMIEST cruisers on the water.EXCELLENT CONDITION, Professionally maintained 310 express. This Boat has a 6'4" Cabin Headroom that accommodates all. Loaded with options to assure you are well provided for, wether it is a weekend getaway or relaxing with friends while anchored. Sleeps SIX with foward and aft births and a Dinette that converts to sleep Two. New (07) Starboard Motor with Warranty until spring 09. This boat planes extremely easy. Complete Port Motor tune up in 07. Complete Bottom Paint in 07. All Lines and Fenders (6. new in 07) are included. This Boat will be Summerized and Water Ready at time of Purchase.